The Exhibition will be open from May 1 - June 8, 2018 in our second floor gallery. John Ross has been represented by The Old Print Shop for many years. John was energetic, creative, and collegial. He liked people and it showed. He would start projects and bring in other artists. He was always coming up with new ideas and ways to make them work. As an artist he was involved with many portfolio projects. Some were started by him and to others he supplied a print. He became interested in the Artist Book and started High Tide Press to produce them. He produced his own art books and got other artists involved to help publish their work. As a teacher he taught printmaking and drawing for many years, and it is interesting that many of his students continued taking evening classes with him. I will miss my conversations with John. John Ross was born and raised in the Highbridge section of the Bronx. He discovered his love of drawing as a young man, sketching his friends and their pets in the building in which they lived. He is remembered today as an outstanding printmaker, painter, author, and educator. He co-authored The Complete Printmaker with his wife, Clare Romano. The book, which is still in print, was updated by their son, Tim Ross. Ross taught printmaking at the New School for over fifty years and was a professor of studio art at Manhattanville College for twenty two years. He founded the High Tide Press, producing nineteen artists’ books. He printed his own work and also collaborated with other artists and poets. A complete set of his artists’ books are in the Beinecke Rare Books Library at Yale University. Ross was a member of the Society of American Graphic Artists and served as president from 1962 to 1965. He was elected Academician in the National Academy of Design in 1983. Ross graduated from DeWitt Clinton High School and received a BFA from Cooper Union School. He enrolled into Cooper Union in 1939, and in his second year he met the love of his life, Clare Romano. She first saw Ross, who was a big fan of jazz music, playing a T-square like a saxophone, while sitting underneath the table in the cafeteria. Like many of his era, Ross’s education was interrupted by WWII. In the spring of 1942, he enlisted in the Army Air Corps. The Army quickly identified his ability to draw and sent him to train to be a cartographer (mapmaker). Before he was deployed to southern Italy in 1943, he returned to New York City and married Clare Romano. As a mapmaker his job was to create maps for the bombing missions the next day. He and the other cartographers would wait for the planes to return from the day’s run. The mapmakers would analyze the images from the planes’ cameras to determine the results of the previous mission. They then drew the maps for the missions the next day. After the war, Ross remained in southern Italy helping with the construction of airfields and other logistical activities, and he developed a lifelong love of opera. Clare Romano was a first generation United States citizen. Her parents emigrated from Italy, and as fate would have it, Ross was stationed in Italy near her ancestral home. On days off, he would visit the relatives, as well as attend opera productions. After his return to New York, he went back to Cooper Union and finished his studies. At Cooper he studied with Morris Kantor and Will Barnet, both of whom would be lifelong friends. In the late 1940’s with their good friends, Al and Lotte Blaustein, they decided to go to Europe. The length of the trip was extended to nine months because at the time it was cheap to live in Europe, less than $3 a day. They acquired a car in Italy and were driving into the Alps. The car was small with a tiny engine and at one point in the climb into the Alps, they were not sure the car was going to make it. He joked that he could have gotten out and walked faster than the car was traveling. They took a silly photograph of Clare pulling on a rope as if she were towing the car. This was their first trip to Europe, but it would become one of many. In 1949 they studied briefly at the Ecole des Beaux Arts in Fontainebleau before returning to New York. On their return Ross furthered his studies at the New School for Social Research with Antonio Frasconi and Louis Schanker. Ross was successful as an artist and commercial illustrator. As an illustrator he worked on advertising campaigns and designed record jackets for Columbia Records and others. 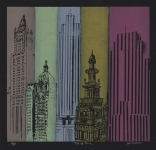 John Ross and Clare Romano also collaborated on many book projects, including Manhattan Island written by May Garelick, illustrated by them, and published in 1957. In 1953 they moved to Englewood, New Jersey. He designed and had house built with a large studio for their work, where they raised their sons, Timothy and Christopher. 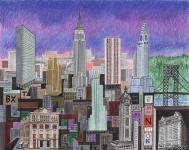 Ross joined the faculty of Manhattanville College in 1964 where he taught studio art until 1986. He designed the BFA program, and served as chair of the art department from 1966 to 1972. The United States Information Agency selected him to be an artist in residence in Eastern Europe, where he taught printmaking in Yugoslavia and Romania. It was during this time that he helped develop the collagraph technique, in part serendipitously. He was getting copper plates for etching from Vienna, when the supply ran out. Ross and Romano devised a process of gluing together textures on a cardboard backboard and printing on an etching press – a kind of printed collage--a process for which they would become famous. He embraced the process, as he enjoyed the freedom of the variety of the textures and the creative ability to arrange them at will. The term “collagraph” comes from the Greek word “koll” or “kola” which means glue, and “graph,” indicating the activity of drawing. 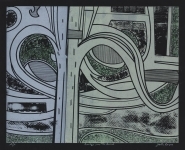 The way John applied the process he combined intaglio and relief, wiping ink into the plate like intaglio, then rolling color ink like relief. 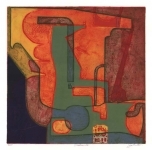 The two were instrumental in developing the collagraph as a print medium: Ross taught it at Manhattanville College and The New School, and Romano taught it at Pratt. In 1986 John Ross and Clare Romano sold their home in Englewood, New Jersey, and moved back into Manhattan in the Gramercy Park area. They had also purchased land in Springs (on the bay side of East Hampton), and Ross designed and built a beautiful home with three studios, one for wife, one for him, and one as a printing studio. They traveled extensively in Europe and across America. Clare Romano was the summer printmaking teacher at Pratt. The summer program was in Venice, Italy, so for twenty summers in a row they were in Venice. Around this time, Ross began a new career as artist, designer and publisher of artists’ books, and established the High Tide Press in 1991. His own books had a wide and inventive range, sometimes with a Venice-related theme, and he also published books by other artists, such as Frederico Castelon. In 1998, his Birds of Manhattan, with Lloyd Jonnes as author of the text, was chosen for “50 Books/ 50 Covers,” by the American Institute for Graphic Arts in New York. During their time in Venice, Ross became involved with the Typographical and Printing Institute in Valdobbiadene in the Veneto. He collected antique typefaces which he printed with and in some cases used as sculptures on book covers. He had thousands of antique typefaces and in his nineties he donated them and his Vandercook press to the Center for the Book Arts. John Ross and Clare Romano were both consummate artists. Wherever they traveled, they produced art. Over several years they spent time in the Southwest, producing a remarkable body of collotypes, paintings, and drawings of the New Mexico landscape. Ross’s accolades include the Louis Comfort Tiffany Grant for Printmaking in 1954; five MacDowell Colony Fellowships from 1977-1983; the National Arts Club Printmaking Award in 1995; the National Academy of Design - Shatalov Prize in 2001; and the Society of American Graphic Artist’s Award in 2005. Ross’s work has been widely shown including over sixty solo exhibitions. His work is in the collections of the Boston Public Library, Boston, MA; British Library, London, UK; Cincinnati Art Museum, Cincinnati, OH; Dallas Museum of Art, Dallas, TX; Hirshhorn Museum, Washington, DC; Library of Congress, Washington, DC; Metropolitan Museum of Art, New York, NY; National Academy of Design, New York, NY; Newark Museum, Newark, NJ; Philadelphia Public Library, Philadelphia, PA; Smithsonian Museum of American Art, Washington, DC; Victoria and Albert Museum, London, UK; Whitney Museum of American Art, New York, NY, among many others. John Ross, 96, died peacefully in his sleep on November 29, 2017. He is survived by two sons, Timothy, also an artist, and Christopher, a medical researcher, and by a granddaughter, Hilary, who is a graduate student at Tufts University. Below is a selection of of John Ross's work. If you would like to view more, please visit his artist page. The Art of Fruit Desserts.